I’m currently reading this book, and I like it so much, I’ve decided to gift two copies. The gifting will be done through Smashwords, where you can get any format you need. She flew straight to the bedroom and its adjoining bathroom the minute she stepped into the cold dwelling, wanting to get to the pills she had to take—pills scheduled like clockwork every six hours, and the reason why Nathaniel had said they needed to get back before Peter came home. She could ditch them down the drain while Nathaniel struggled to get in with the mountain of shopping bags she’d piled on him back at Selfridges, and thus escape the drugs’ heavy, losing-control sedation. As she closed her hands on the vials in the medicine cabinet, she froze. The plastic tubes rolled with a clatter of shaking pills into the sunken marble sink. Her breath hitched in her throat as she sensed more than heard his approach, his Italian loafers making no sound on the bedroom carpet, then on the polished floor tiles of the en-suite. Like a stealthy big cat, a predator on the move… The closer he got, the more she recoiled and cringed, dreading the feel of his cold, slimy paws should they touch her. He dipped his head so his mouth would be level with her ear, and the whisper of his breath teased her skin with a malevolent reek. His tone thrummed low, soft, chilling…with a hint of mockery, a distressing reminder that he called the shots around the house. Gone was the distant, detached man who had been by her side at the hospital. In his place had settled a manipulating monster who took pleasure in making her jump out of her skin. Against her will to not give in to his silent threat, her body shook with subtle tremors. The one vial of medicine still in her palm rattled with a nerve-wracking jangle as the pills inside danced from the involuntary movement. Couldn’t she be made of sterner stuff? Why did he have this effect on her, damn it? Peter placed his cold hand onto hers and rubbed his long fingers along her wrist. She yearned to shrink back from the creepy, reptilian touch, but she couldn’t move. He’d make her do what she didn’t want. He’d make her take the drugs. Misery threading an icy path down her spine and into her soul as he reached for the small bottles. Her lower lip trembled to contain a sob, and she bit down on the flesh so hard, the coppery tang of blood flooded her taste buds, making her yearn to retch even more. 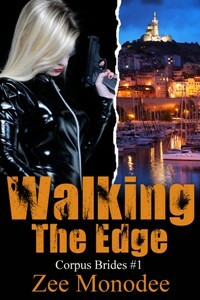 His still-low voice sliced her like a thousand shards of sharp crystal, stabbing into her gut and at her pounding heart. He took one pill from each of the white vials, and two from the pink one, before he cradled her hand in his and placed the little spheres in her palm. After putting the medicine bottles back in the cabinet, he swung the door closed. The mirror on the panel reflected their images. She stifled a gasp when the visual confirmation that he stood so close drove home. What a devastatingly handsome man; tall, with pale skin as flawless as the most precious Italian marble. His eyes had a unique, deep green hue, and locks of his expertly cut dark hair—the shade as intense as gleaming mahogany—brushed his wide forehead, which tapered down to an otherwise lean face. But no soul existed behind that façade. Nothing but darkness… And she couldn’t let him win. Ever. She tore her gaze from his reflection to stare at her own. For all the racing heartbeat and thundering blood pounding in her veins and at her temples, her face betrayed no hint of the fear and pooling dread inside her. No, she appeared detached, regal, as if she didn’t give a damn. Peter filled a glass at the tap and placed it in her other hand. His stare caught hers in the mirror, and she shook inwardly at the empty hollowness of his soul that darkened his bottle-green irises. Drink, they seemed to order, a barely concealed command obvious in the penetrating gaze. No, she craved to scream, but something else took over. She needed to show him she’d never cower. Defiant, she threw the pills into her mouth and swallowed them with a big gulp of water. Satisfied? Her blue gaze insolently asked as she stared back. He smiled. Only the corners of his mouth stretched, his eyes remaining hard, emerald stones in the smooth, chiselled perfection of his otherwise expressionless face. She shivered—at his calm, detached demeanour, or at the drugs hitting her bloodstream with no food as a buffer in her empty stomach? The stuff he plied her with proved potent, and it could knock her out in minutes. Already, she grew groggy, wisps of oblivion snaking through her consciousness and laying siege upon her mind, intent on numbing any functioning neuron in her system so the abyss could consume her. Peter’s hand settled under her elbow, the chill of his touch permeating the fabric of her cashmere twin set. He made her turn around, his grasp firm as he led her, stumbling steps and all, into the adjoining room. As her blurred vision made out the silhouette of the king-size canopy bed, the last thing she clearly recalled before darkness claimed her was someone pushing her forward with all their might.